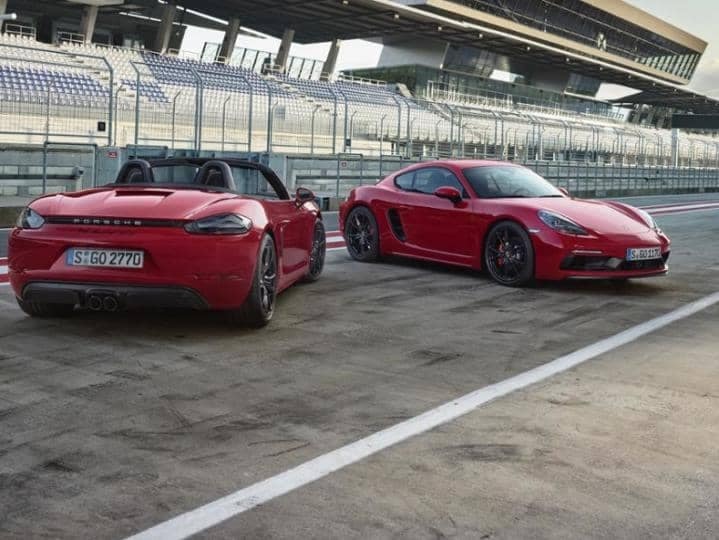 The vehicles’ power has now been increased to 269 kw (365 hp; 718 Boxster GTS and 718 Cayman GTS: Fuel consumption combined 9.1 – 8.2 l/100 km; CO2 emissions 207 – 186 g/km) thanks to a newly developed intake duct and an optimised turbocharger for the 2.5-litre, four-cylinder boxer engine. With these improvements, the engine delivers 11 kW (15 hp) more power than the 718 S model and up to 26 kW (35 hp) more power than its GTS predecessor models with naturally aspirated engines. The new mid-engine sports cars are available with manual six-speed transmission or optional Porsche Doppelkupplung (PDK). The GTS vehicles are equipped with a host of options as standard, such as the Sport Chrono Package, Porsche Torque Vectoring (PTV) with a mechanical rear differential lock and Porsche Active Suspension Management (PASM), which lowers the body by ten millimetres. The maximum torque of 430 Nm provides even better acceleration and flexibility values. This is available between 1,900 and 5,000 rpm. When combined with the PDK and Sport Chrono Package, the GTS models accelerate from zero to 100 km/h in 4.1 seconds. The vehicles’ top speed is 290 km/h. The GTS models stand out within the 718 model line not only in terms of technology, but also in their visual design. The new Sport Design apron at the front of the vehicle emphasises the vehicles’ sporty character. As is typical for GTS models, the front light modules and the Bi-Xenon headlights are black-tinted. At the rear of the vehicle, the tinted tail lights, black logos, black rear apron and centrally positioned black tailpipes of the standard sports exhaust system give the GTS its unique appearance. Black GTS logos at the base of the doors and 20-inch wheels painted in black (satin finish) complete the side view. GTS genes also shape the interior. The stopwatch of the Sport Chrono Package (included as standard) is integrated as a central component of the dashboard. Both the driver and front passenger can enjoy sports seats, which feature Alcantara centres as with the other Porsche GTS models. The sports seats Plus with GTS logos on the headrests can be electronically adjusted in two ways and provide increased lateral support and comfort. In addition, the interior features a high proportion of Alcantara, which can be found on the steering wheel trim, centre console and armrests, for example. Furthermore, drivers with a particular passion for sport are assisted by the Porsche Track Precision App (PTPA), which enables the driver to automatically record, display and analyse driving data on their smartphone.